Informative and/or amusing since 2010… Have a tale to tell about your travels or expat experience? Send it on in to gnomeless.com@gmail.com. Well, we’ve been in Korea for close to a month and a half now and we haven’t really done many touristy things. So on Tuesday we remedied that and visited Haedong Yonggungsa, a spectacular Buddhist temple complex on an outcrop of rock overlooking the sea in Busan. We went with KJ’s friend Gae-young and her four-year-old niece Young-ju, whom we picked up at kindergarten after lunch. I don’t think she knew in advance that she would be meeting a 6’6″ white dude and a rambunctious mixed race toddler that day. The poor little thing seemed a bit stunned the whole afternoon. In the beginning, I wasn’t too sure about Haedong Yonggungsa, because the first thing you encounter as you walk in from the parking lot is a string of tacky little shops selling snacks and trinkets. Once you get past all that, though, the good stuff comes, starting with a row of imposing rock statues of the twelve animals of the Chinese zodiac. These amused Ian greatly. After that, you come to a stone bridge. 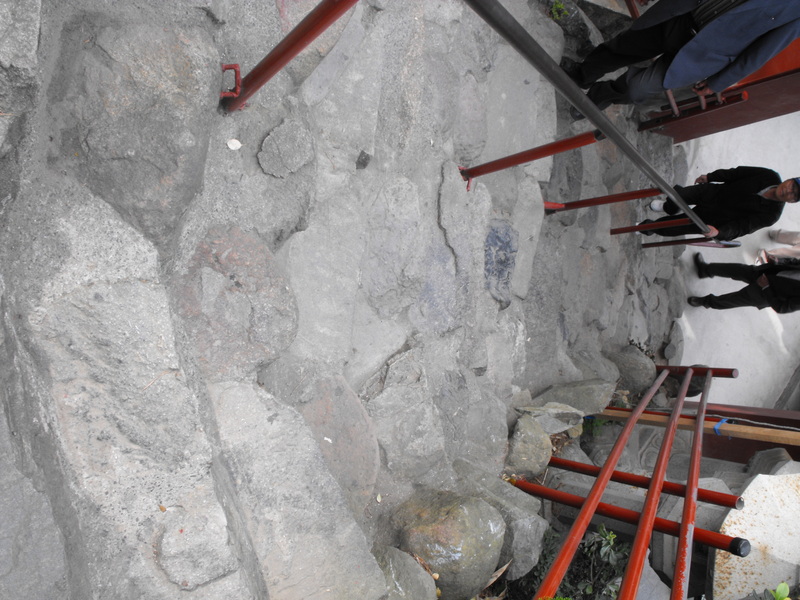 At the midpoint of this bridge, down below, are two stone figures. The lowest one is a tortoise with a bowl on its back and the one above is a goddess holding a bowl. This is one of the ways the temple makes money. If you can throw a coin into the goddess’ bowl, your wish will come true. I probably threw about twenty 100 won coins (about 10 cents) at the darn thing. I came close several times, but I didn’t manage to hit the target. Next time, I guess. All religions should make donating money this much fun. 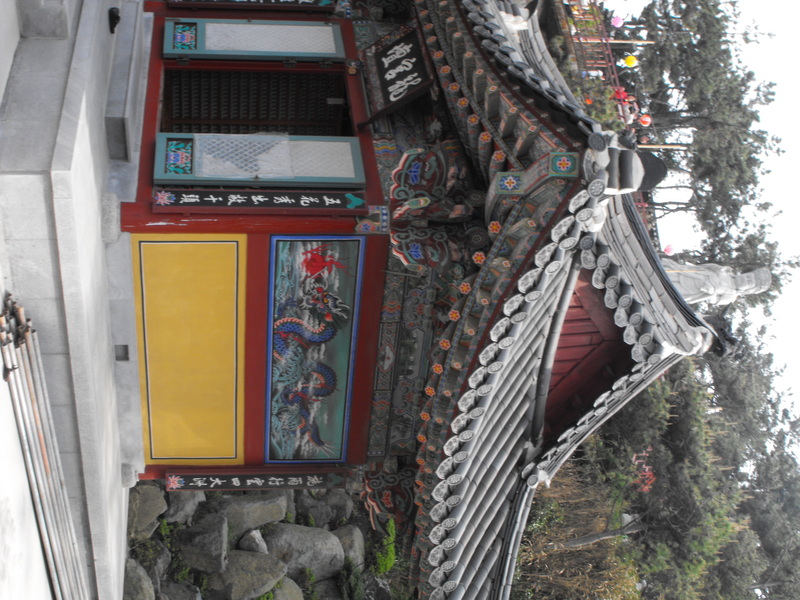 The story goes that Haedong Yonggungsa was founded in 1376 by a great Buddhist teacher known as Naong. 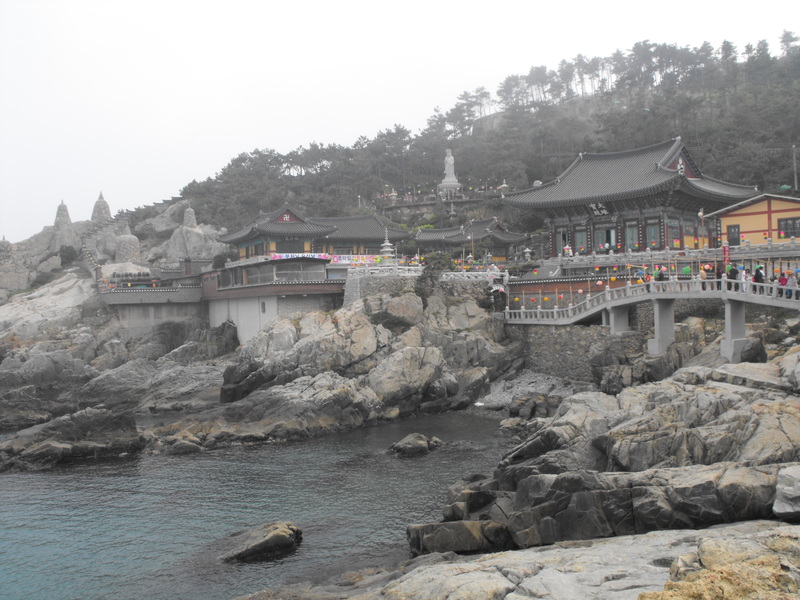 Unlike most Korean Buddhist temples, which are built on mountains, Naong built his temple by the sea to honor the Great Goddess Buddha of Mercy. She lives alone near the sea, apparently, and rides on the back of a dragon. 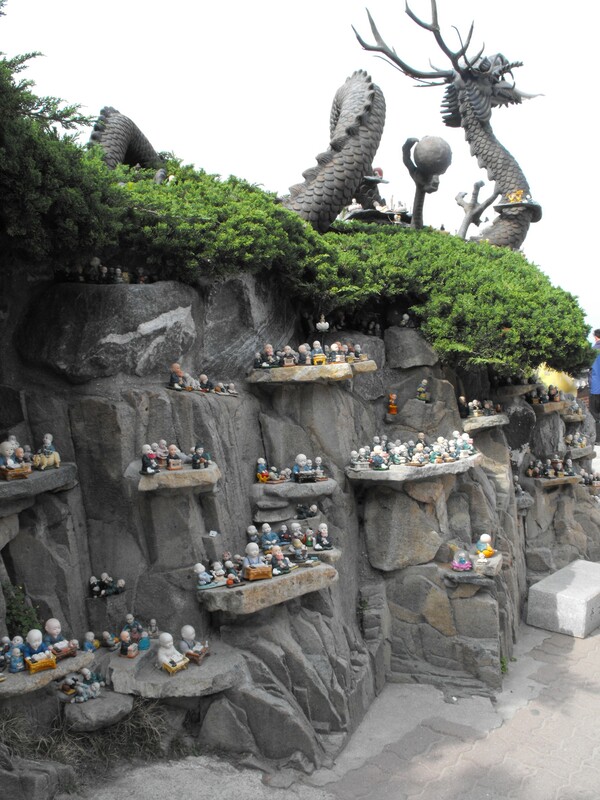 Devotional figures left near a statue of the Great Goddess Buddha of Mercy's ride. 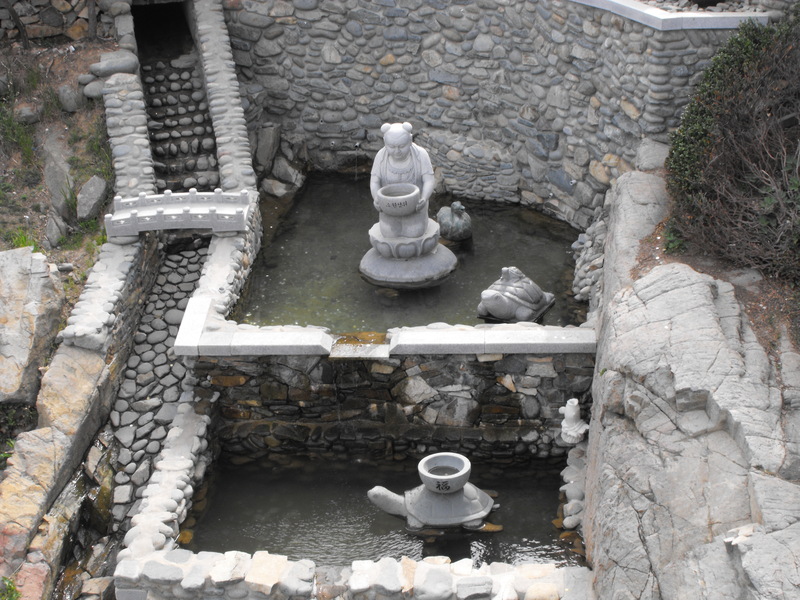 It is said that Naong was practicing asceticism in Gyeongju when the country fell victim to a terrible drought. The crops died and there was famine. The people were greatly upset at the gods for allowing this to happen and for not giving them rain. During all this, a sea-god appeared in a dream to Naong one night. The sea-god said that if a temple was built at the edge of Bongrae Mountain and if the people prayed there, the drought would end and happiness would return to the land. Naong was soon on his way and got started on the temple shortly thereafter. Many believe that if they pray hard at Haedong Yonggungsa, at least one of their wishes will be granted. As a result, it’s not just a popular spot for tourists. Lots of devotees come here, too – although I must say that I didn’t see a single Buddhist monk while we were there. Probably the first time I’ve ever been to a church, temple, mosque or synagogue without seeing a person of the cloth. 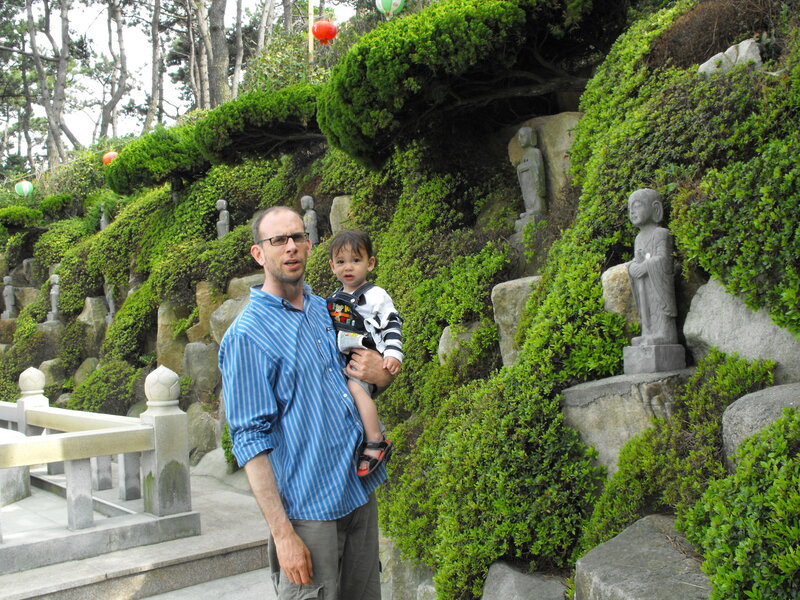 My little guy and I check out all the little Buddhas. 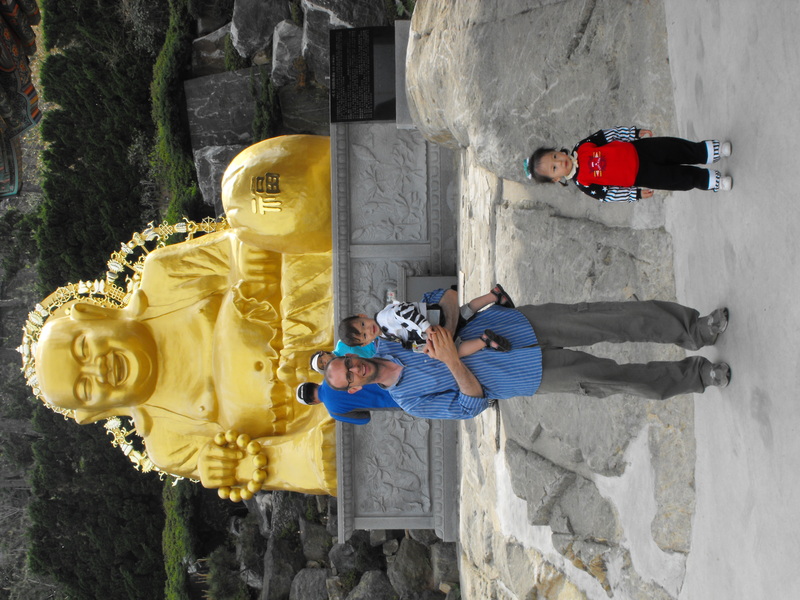 Young-ju stands a safe distance from me and Ian as we all pose in front of the big gold Buddha, called Podaehwasung. If you rub his belly or nose, you will have a son. 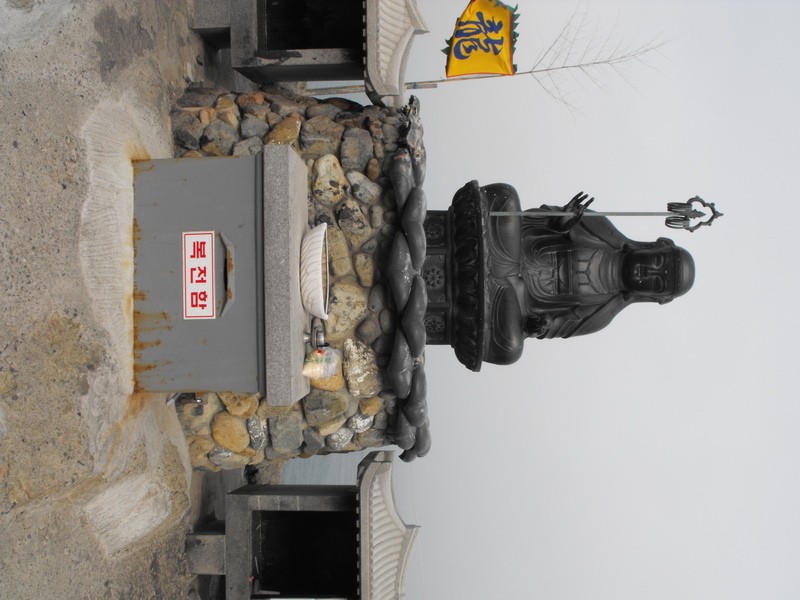 A statue of the Great Goddess Buddha of Mercy towers over one of the small temples at Haedong Yonggungsa. This is apparently the largest statue in South Korea carved from a single piece of stone. I don't believe the steel rods have any special significance. The Jijang Bosul, a minor deity with the power to save people from hell. 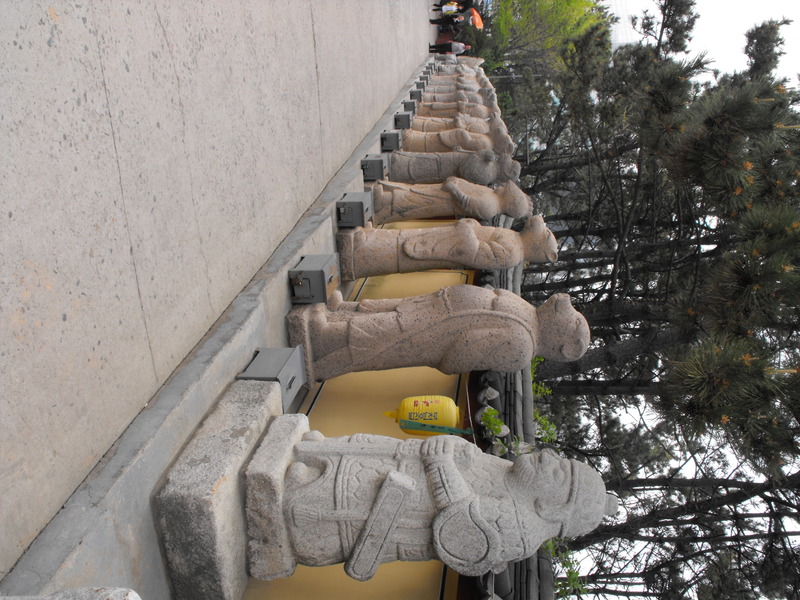 Imposing statues of the twelve Chinese zodiac characters lined up to wish us a fond farewell as we made our way back to Gae-young's car. And, no, Haedong Yonggungsa is not wheelchair accessible.